Making birdhouses for chickadees and other small birds. I have a lot of birds around my house near Crystal Beach and Lake Erie. They have been coming to the bird feeders with enthusiasm and now it's almost spring (-27 C last week you would not know it) I want to put up some birdhouses. 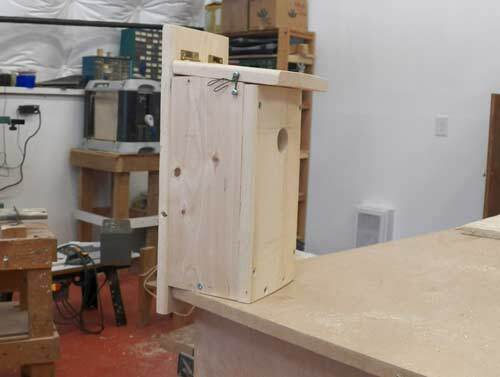 I am starting with a cavity nesting songbird house good for a whole list of birds including chickadees. There are lots around and I really like them. If I go out and hold up my hand with sunflower seeds, a chickadee will come, land and very quickly take a seed and fly off. They are very friendly and will call out to you if you "chikcadee-dee-dee to them." They also like to come to the suet/peanut butter feeder and quietly eat. My plans come from 50birds.com They have several pdf plans for free. 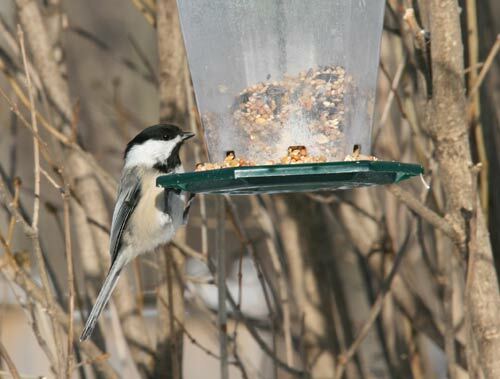 It is suggested for chickadees, nuthatches and downy woodpeckers. These are all birds that come to the feeder so maybe one of them will move in. I've found some boards left over from a project and cut them to size. I used the chop saw for the length and the table saw to cut the boards to the right width. I think I could have cut with a hand saw quite easily. 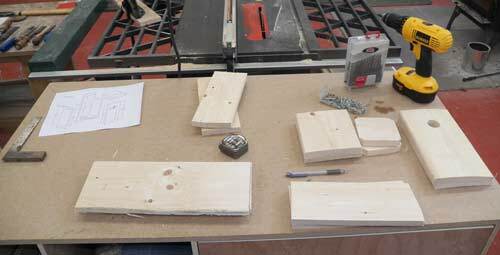 I cut pieces for 2 birdhouses. The corners of the bottom pieces and the top of the side are cut to allow some ventilation and drainage. The top is hinged to allow for inspection and cleaning out the houses after the season is over. These boards are terrible. Not only are they cupped, but they are not even thickness and are full of knots. They will not smooth out in the planer either. I think they are spruce. Their only virtue was their price. Fortunately, the birds will not care about finish or slight warpage so I can use them. The opening is 1 1/8 inch wide. This is important since some of the larger birds who are a bit of a nuisance cannot get in and hurt the babies. The plans are on the link above. 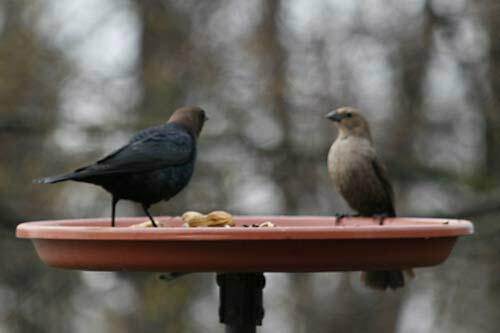 It also keeps birds like the cowbird out because they cannot fit in. The lady cow-bird goes in and lays her eggs in other bird's nests and takes off to let the other mother hatch and raise her chicks. Cuckoo's do this also I'm told. They are about the size of a starling but stockier. I used screws to put together the birdhouses. I drilled pilot holes for the screws because the wood is not very solid and easy to split. 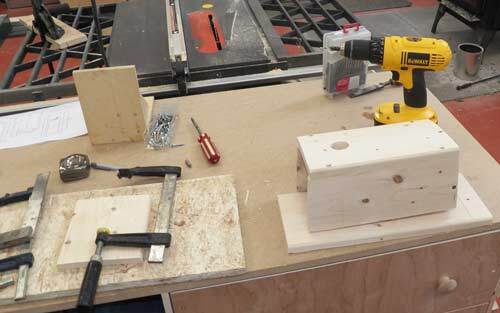 I also used bar clamps to hold sides together while I drilled and screwed because everything is warped a little. I did not use any glue in case the birds did not like the smell. I don't know if it matters but I'll see if it would help and in the future I will use glue if necessary. 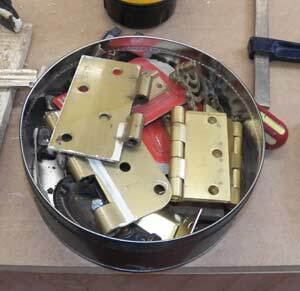 I checked my box of old and leftover hinges and found some lovely brass hinges near the bottom, that will certainly outlive the birdhouses by years. It's always so satisfying to go to the junk boxes and find what you need. It makes being a pack-rat worthwhile. Here is a completed birdhouse. No finish except a rough sanding. It does not get perches either. Apparently this makes it easier for the bad guys to access the hole. The top is wired closed. If I had had a latch I could have installed it but for use once or twice a season a couple of screws and some wire will do for now. It gets hinged so the birdhouse can get cleaned out. It gets wired shut because squirrels and other strong critters such as raccoons can actually force their way in and get the eggs and birds. I attached the birdhouses using rope and zip ties. I did this while there was still lots of snow on the ground so the birds would have a chance to get used to the 4 bird houses. In May, a small kind of sparrow, not the big European sparrow but a smaller native species, moved in and have been going in and out. At least one other house is in use as well by what looks like a nuthatch but I'm not sure. So all is well.